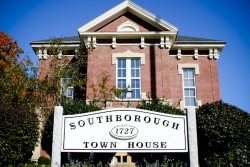 The Town of Southborough announced that the Board of Selectmen will hold office hours this year. The hours begin with a morning session this week and evening session next week. According to the announcement, we should stay tuned for Saturday hours as well. The announcement credits Chair Lisa Braccio “for kicking this idea into fruition” and refers to it as one of selectmen’s goals for 2019. It is intended for community members to stop by and speak with a selectman in person about any questions or concerns. The hours will be held at the Southborough Town House in the McAuliffe Hearing Room on the 2nd floor.